East London based street artist and illustrator Ronzo is looking for your support to get his indie game ‘Derrick the Deathfin’ on to mobile! 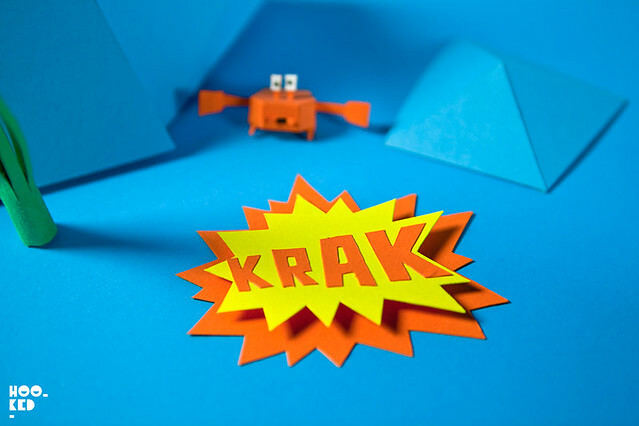 The game is a fast-paced arcade action sideways scroller which has been set in an aquatic world which Ronzo has made entirely out of paper and card. 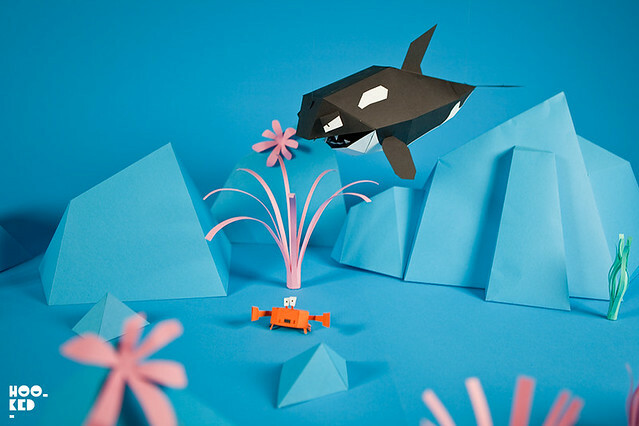 Ronzo enlisted an army of helpers who together spent hundreds of hours painstakingly folding paper, cutting and gluing to craft Derrick and his underwater home world. 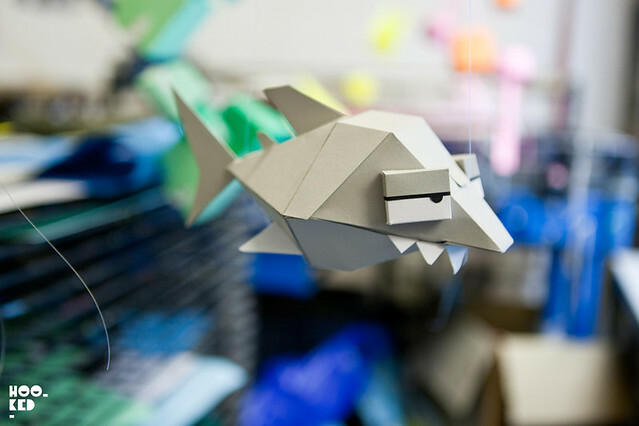 Hookedblog stopped by Ronzo's studio back when he and his team were hard at work assembling and crafting the underwater sea creatures and objects that feature in the game. 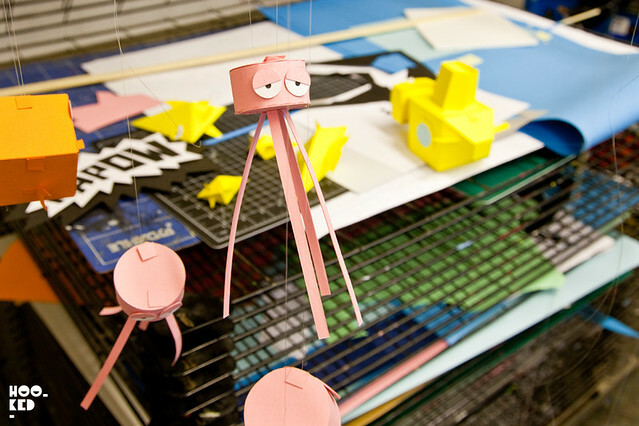 We were fortunate enough to be allowed to capture some photos of these amazing paper creatures and the little model sets and underwater sceneries they assembled which were filmed and turned into an actual playable game with help from their computer wizards Ten24. Ronzo then worked with Indie developer Different Cloth and together a truly exciting video game was created. This little Indie title is currently available on Steam and PSN. Derrick is swimming to mobile real soon with your help. Check out the Kickstarter video for the project below. 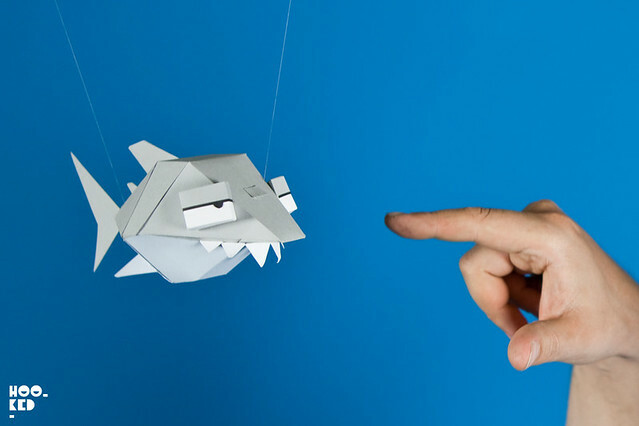 Derrik The Deathfin for mobile Kickstarter video. With your backing, Ronzo hopes to create the mobile version for Derrick - specifically for iOS and Android phones & tablets. As with almost Kickstater campaigns there are loads of amazing rewards for you backers - and in the higher tiers the rewards are completely bespoke and limited edition. Ronzo will only make a few and he will make them just for you! From t-shirts to pin badges all the way up to a giant Derrick card board shark models and custom made signage or billboards in the game there are great rewards for all budgets. Please support the project here on Ronzo's Kickstater page. What are you waiting for? Let's #SaveTheShark.